The book features a collection of memories contributed by past pupils from every decade since the foundation stone for the school was laid in 1913. As well as information on the history of the school, the book contains profiles of its principals and teaching staff down through the years, and a large selection of intriguing photographs depicting the school's past to present. at € 10. All proceeds from the sale of the book will go to the provision of facilities for the school. NewsFayre, Pearse St. J.K.C., Pearse St. Donal O'Connor's, Kenyon St.
Paddy Walsh & Sons, Kenyon St. Moynan's Bike Shop, Kenyon St.
A Sportsman's Dream, Kenyon St. Fox's Bookshop, Mitchel St. Principal John O'Gorman with third class pupils at St Mary's Junior Boys National School in October 1939. St. Mary's Junior Boys School is 100 years old this year. The Centenary was marked on Sunday 16th of June with a Mass in St.Mary's of the Rosary . After the mass ,members of the community and pupils past and present were invited to the school to look at old roll books and photographs recalling their past school days.On Thursday 23rd of May a book on the history of the school was launched in the Abbey Court Hotel. 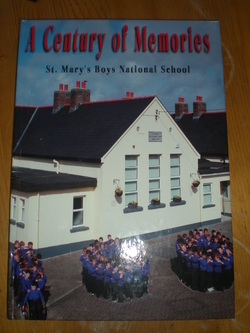 The book contains photographs of the pupils, teachers and principals that attended St Mary’s over the decades, along with memories and anecdotes from those years.